Visit here to see the lens' technical specifications and MTF graphs; if necessary, you can find simple explanations of the terms below here. 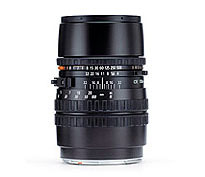 Hasselblad V–series lenses define what the proper quality of lens construction should be. The CFE 4/180 is very solidly built and a pleasure to handle and use. Operation of the shutter speed and aperture ring, as well as that of the DOF preview knob located on the lens barrel, is smooth and substantial. Very importantly, operation of the focus ring is silky and precise (meticulous and accurate focusing of telephoto lenses is absolutely crucial to obtaining the best sharpness possible, and this is the main reason why I prefer this lens over its predecessor, the CF 4/180 lens, even though both lenses have the same optical design). At 1075g the lens is not exactly light, but nor is it heavy considering its focal length. The lens is not exactly small, too, but it still fits vertically into my ThinkTank Airport Acceleration camera backpack when the backpack is lying on it back, and thus the optic is not too much of a burden for travel. The only gripe that I have with it is that lens is front–heavy and makes the camera "nose–dive", so that hand–holding the camera is quite strained. This is very obvious when you handle the lens for a few minutes, and it really gets to you when you use it extensively in the field. This is not to say that the CFE 4/180 is completely unsuitable for hand–held photography, though—I am sure that one can get used to it. Technically, there is vignetting; aesthetically, there is no vignetting. This is to say that unevenness of illumination that the lens exhibits is mild and gradual; you are unlikely to notice it unless you juxtapose two identical shots of an evenly lit surface taken at f/4 and, say, f/16. In other words, vignetting signature of the lens is gracefully unnoticeable. This lens is phenomenal. You might have already read elsewhere that it is among the sharpest lenses in Hasselblad history, but what is mentioned less often is that at magnifications of up to 10X the difference in sharpness is almost indistinguishable centre–to–corner and at all apertures (including at close distances). Knowing, however, that there has to be a difference between f/4 and, say, f/8, I used a 15X loupe to further examine test slides. As expected, at f/4 there is perceptible softness in the corners, but it should be noted that softness in the corners at f/4 is inconsequential for most intents and purposes unless you intend to photograph flat objects at wide apertures. As expected, once you go past f/16 or so diffraction takes its tall and image quality begins to decline. The lens exhibits insignificant pincushion distortion that would only be noticeable to an experienced eye in a photograph with a perfectly straight line running along and very closely to one of the sides of a picture. Indeed, given the focal length of the lens and its intended fields of application, one really has to go out of his way to make the distortion that the lens produces noticeable. Appearance of out–of–focus areas is great right from f/4 on, which, in my experience, is quite rare. This means that one can shoot portraits with very nice blurred background even wide–open without, which also goes hand–in–hand with the gradual vignetting signature at this aperture. Bokeh example images can be found in the article mentioned at the end of the review. Reviewing Hasselblad V–series lenses is both boring and exciting. It is boring, because there is consistency in their performance: you sort of know what to expect and, as usual, there is not much to complain about; and it is exciting, because using a fine lens is always a treat. At the same time, it is never a waste of time: each lens has its unique characteristics and knowing them well allows obtaining the best image quality that each individual lens can deliver. If 180mm is a focal length that you favour and you are prepared to live with the handling peculiarity mentioned above, then I recommend the Sonnar CFi 5.6/250 without reservations.